Construction of the duomo began in 1386 and took six centuries to finish. It is the largest church in Italy and the fifth largest in the world. It is an incredible example of Gothic architecture, from the outside’s flying buttresses, to the interior’s stained glass windows. Be sure to buy your tickets online ahead of time in order to avoid the long line, especially in the summer. In the same Piazza as the Duomo di Milano, you can find the Galleria Vittorio Emanuele II, a practically ancient shopping mall built in 1865 and named after the first king of Italy. Today, the arcade contains mostly luxury stores like Prada, Swarovski, and Louis Vuitton, and Michelin star restaurants such as the Pavarotti Milano Restaurant Museum. While the Navigli was a bit out of the main city center, it was well worth taking the longer metro ride to see it. The Navigli used to be a series of canals used for irrigation purposes and transporting of supplies, it is now more of a nightlife scene and hangout area filled with restaurants, bars, and life music. I loved coming here in the evening. As the sun began to set and the sky turned orange, the temperature cooled. Many restaurants in this area offer a 10 euro apertivo buffet and drink deal. The Last Supper painting is housed in the Convent of Santa Maria delle Grazie. The painting itself takes up an entire wall - it’s 460 centimeters tall and 880 centimeters wide. Da Vinci began painting The Last Supper in 1495, so unfortunately most of the painting today is cracked and faded. In fact, before entering this room, visitors must first stand in a dehumidifying chamber. To see the famous work of art, you must buy your tickets months in advance. Contrary to American beliefs, Italian food is not just pizza and pasta. Italian food differs greatly depending on the region. In the region of Lombardia in northern Italy, most dishes are polenta or risotto based, such as Risotto alla Milanese which is a creamy rice-like pasta cooked with saffron. I was pleasantly surprised by the delicious taste of this risotto with bresaola in a white wine sauce. This is the most popular art gallery in Milan, which holds paintings by Raphael, Bramante, and Caravaggio. In addition, the Brera Academy holds art classes here. Just behind the Pinacoteca, there is a 5000 square meter public botanical garden, which is worth visiting as well. After spending the morning at the art gallery, stop into one of the nearby restaurants for a wonderful Italian lunch. Learning so much will surely whet your appetite. This artist quarter is absolutely gorgeous for just strolling around and is right in the center of the historical section of Milan. Just a short walk from the Duomo di Milano, you can find one of the leading opera and ballet theaters in the world. Most of Italy’s best opera singers have performed here. It has been partially rebuilt and renovated since a bombing during World War II. The Sforza Castle was built in the 15th century and houses many art exhibits, its most famous being the Rondanini Pietà by Michelangelo, which the famous sculptor worked on from the 1550′s until death. Seek refuge from the hot summer sun in the shade of the trees after visiting the castle. Best yet, pop open a bottle of my favorite wine - a fizzy sweet and local red from Lombardia. These are wonderful suggestions! What is it like to stand in a dehumidifying chamber? Does it take long for they to dehumidify you? It's so weird! I actually only knew this little fact because it was written in Rick Steve's Italy book. Otherwise, it's rather unnoticeable. As the tour guide talked to us, she led us past one room, then another. At one point, she stopped and the door behind us closed. She continued to talk, and while I couldn't FEEL anything, I knew we were standing in this airtight chamber. My skin didn't feel any different or anything though. I only had 2 days in Milan, so definitely need to go back and finish off some of the items on your list. I will say though that the Duomo is so amazing, I just couldn't get over all the details and the amazing stained glass. I would go back there again next time I am in Milan. Thank you for reading Anisa. Yes, you should certainly return! I loved the duomo too. I just couldn't believe how each and every sculpture, every tiny detail on the roof was unique. Crazy! Great tips for MIlan! The Duomo is so beautiful and a risotto alla Milanese is a must! Good to know about the aperitivo - I've experienced it in other Italian cities but never in Milan. Apertivo is either something you love or hate, I have observed. Sometimes, they serve really good wine and homemade dishes... other times it's stuff like dry crackers and corn nuts and super dry wine. I adore architecture, especially Gothic style. The art and history here is spectacular!! I really love gothic style architecture too! I did a whole research project on it in high school :) Thank you for reading, Jen. Lombardian food?! SAY what now? I have never heard of it... BUT NOW I MUST HAVE IT! Ahhh!! I am so glad to have introduced you to it!! It's delicious. Not the typical Italian stuff. It's heavier. Comfort food, I think. Actually, the wiki page is quite informative! One of my favourite things about travelling in Europe is the architecture.More times that not I'm looking up instead of watching where I'm going! Your picture of Galleria Vittorio Emanuele II is absolutely beautiful!!! The gothic architecture was one of the most stunning parts of Milan to me when I visited! Your pictures are giving me serious wanderlust to head back there! Wow such incredible pictures! I have been to Italy a few times now from Australia but always seem to miss Milano! This is the inspiration I need1 Thanks for the great suggestions - I would really love to see the Duomo di Milano in real life! I've never been in Milan but i would like to visit in time when is Milan Fashion Week and the Milan Furniture Fair. Actually, Ance, the Milan Fashion Week was just last week or the week before. Maybe you can go next year!!! :D I've never heard of the Milan Furniture Fair... I'm googling that now. You should definitely go sometime, if you get the chance! I hope my tips will help! I didn't have time to stop in Milan when I went to Lake Como. I have always wanted to shop in the Galleria Vittorio Emanuele II and see the Last Supper. This brings back so many good memories of Milan. Amazing culture, and history. I'm glad you liked Milan. Thank you for reading, Larry. The Lombardian Cuisine though!!!! had me all drooling! Everything looks so chic! I'm about to visit Milano this April and I'm super excited about it. Thanks for sharing your thought, I'll definitely take some advice on board. Such beautiful shots you have. I always dream of going to Milan but haven't got the chance just yet. 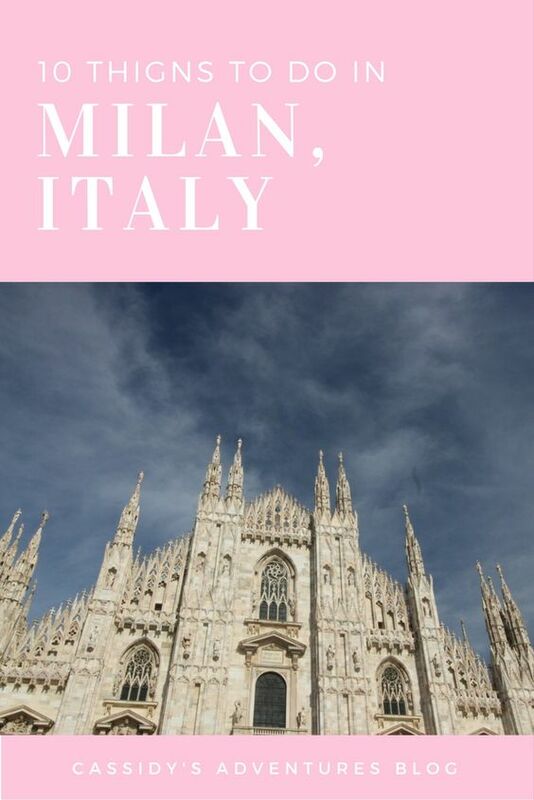 I think that if I had the chance to go to Milan, I would love to explore the food and art! Seeing the Last Supper would be so cool to me, it's a piece of art that I have admired for a long time. I liked Milan but i thought there was just way too many pigeons. It's scary, honestly! I probably won't go back there because of it but otherwise I loved it. Milan has some world treasures. Seeing the Duomo and the last supper are dreams come true. Thanks for these great tips on this great city. Lovely list! I like that you have a good mix of artsy places, fancy places, and places with a more local, down-home feel.